Last week, two reports came out that demonstrate the incredible value of Wisconsin’s Focus on Energy program to our state’s citizens and economy. Focus on Energy is the program that people and businesses across the state use for rebates, advice, and technical support to save money by using less energy. The first was a report issued by a group called the Clean Energy Trust. It showed the number of people across 12 Midwest states who work in the delivery of energy saving products and services and renewable energy technologies. In Wisconsin, we have nearly 25,000 people working in these industries according to the report. Companies like Miron Construction in Neenah, Broadwind Towers in Manitowoc, Cree Lighting in Racine, Trane in La Crosse, and countless small businesses throughout the state are delivering energy solutions for businesses and residents. However, of the twelve Midwestern states surveyed, Wisconsin ranked last in the number of persons working in these industries on a per capita basis. The report clearly shows that Wisconsin has a tremendous opportunity to tap these sectors for further employment growth. The second report was a draft “Strategic Energy Assessment” from the state of Wisconsin’s Public Service Commission. This report showed that Wisconsin has the highest electricity rates of eight Midwestern states. possible by a Focus on Energy Rebate. However, because our citizens use energy more efficiently, our monthly energy bills aren’t the highest. In fact, our monthly bills are among the lowest in the region. The Public Service Commission identified the energy-smart nature of our citizens and specifically pointed to the Focus on Energy program for enabling citizens to save money on their monthly bills. It’s against the backdrop of these reports that our Legislature has recently passed a bill, AB 804, that cuts $7 million each year out of Wisconsin’s highly successful Focus on Energy program. The bill is sitting on the Governor’s desk, and it is my understanding that the Governor has the ability to line-item veto that provision in the bill. Funding for Focus on Energy should be kept whole. Focus on Energy delivers $3.33 in savings for every dollar invested. The program keeps energy bills lower for citizens and businesses, despite Wisconsin’s higher rates. Focus on Energy is supporting thousands of jobs, but Wisconsin is behind our neighboring states. A cut to this program will only make that gap larger. More jobs. Less waste. Saving money. Common sense goals for a stronger Wisconsin, and Focus on Energy is delivering. Let’s keep this program strong now, and for years to come. PRESS CONTACTS: Tyler Huebner, Tyler.Huebner@renewwisconsin.org, 608-575-2201; Pat Mitchell, pmitchell@hastingsgroup.com, 703-276-3266; Jeff Benzak, jeff@e2.org; 202-513-6248. MADISON (March 22, 2016) – Nearly 25,000 people work in Wisconsin’s clean energy industry, according to a comprehensive analysis unveiled today by RENEW Wisconsin, Clean Energy Trust and Environmental Entrepreneurs (E2). The analysis – available at www.CleanJobsMidwest.com – is based on U.S. Bureau of Labor Statistics data and a comprehensive survey of thousands of businesses across Wisconsin and the 12-state Midwest region. The Clean Jobs Midwest report provides detailed breakdowns of clean energy jobs not available previously – including job totals for every county, congressional district and state legislative district in Wisconsin. “As a leading wind tower manufacturer in the U.S., Broadwind draws on Wisconsin’s deep manufacturing heritage to fabricate wind turbine towers in our Manitowoc facility,” said Eric Blashford, president of Broadwind Towers and Heavy Industries, referring to the company’s Wisconsin location on Lake Michigan between Milwaukee and Green Bay. “This same facility that once built submarines for World War II currently employs nearly 300 people in Manitowoc, most of whom are high-skilled manufacturing staff receiving competitive pay and a good benefits package." “As Wisconsin transitions to a clean energy economy, many more of these well-paying jobs will be created throughout the supply chain helping Wisconsinites make a good, stable living,” Blashford said. Energy efficiency is by far the largest clean energy sector employer in the state, with more than 17,000 people, or nearly 71 percent of the clean energy workforce, employed in areas such as high-efficiency lighting, Energy Star appliance manufacturing and high-efficiency HVAC services to reduce wasted energy in homes, schools and businesses. According to the findings, the renewable energy industry accounts for about one in four clean energy workers in Wisconsin, or more than 5,600 jobs – including about 3,700 in solar, 1,100-plus in biomass and nearly 600 in wind. Wisconsin is one of two Midwestern states with more than 20 percent of its renewable energy generation coming from biomass. “Wisconsin’s clean energy workers make up an important and growing sector of our economy,” said Tyler Huebner, executive director of RENEW Wisconsin. “Our last major state energy policy advancement was made ten years ago now, and although we met the goals including 10 percent renewable electricity by 2015, that policy is no longer driving investment. A new policy framework for advancing 21st-century energy solutions would create even more clean energy employment and help us catch up with our neighboring states. Clean energy policies drive job growth across the Midwest and have the potential to help create thousands of good-paying jobs in Wisconsin as well,” Huebner said. 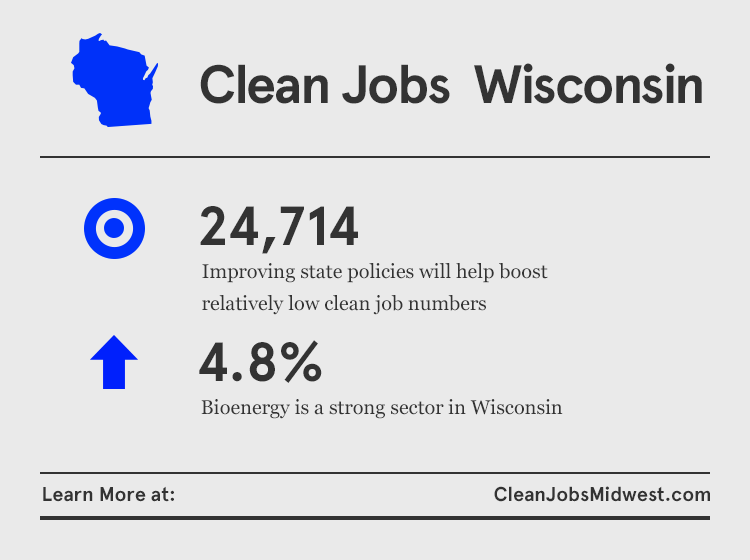 - Most clean energy jobs in Wisconsin – nearly 7,500 – are found in rural areas and non-metropolitan statistical areas. The greater Milwaukee area boasts nearly 6,500 clean energy jobs. - In contrast to Governor Scott Walker’s policy opposing the federal Clean Power Plan, nearly 68 percent of clean energy businesses in the state believe the Clean Power Plan would increase business prospects. - Clean energy employs nearly 569,000 people across the 12-state Midwest region (Illinois, Indiana, Iowa, Kansas, Michigan, Minnesota, Missouri, Nebraska, North Dakota, Ohio, South Dakota, and Wisconsin). “Clean energy is a dynamic sector and central to economic growth in the Midwest,” said Erik Birkerts, Chief Executive Officer of Clean Energy Trust. “Smart public policy will further accelerate the clean energy sector's growth, which means thousands of new jobs created across the region and which will confer economic advantages on Wisconsin,” Birkerts continued. 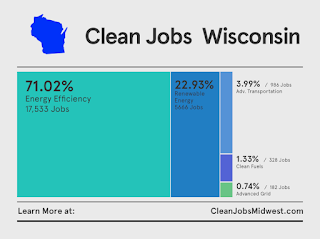 Learn more about Wisconsin clean energy jobs here, and access additional resources for each state and region here. RENEW Wisconsin leads and accelerates the transformation to Wisconsin's renewable energy future through advocacy, education, and collaboration. Clean Energy Trust (CET) fuels clean energy innovation in the Midwest. A Chicago-based non-profit, CET helps launch, fund and grow Midwest clean energy companies to ensure a more prosperous, sustainable future for generations to come. It does this through direct investment, commercialization assistance, mentorship, access to its broad partner network and the promotion of a supportive clean energy community and business climate. Learn more at http://www.cleanenergytrust.org. A new wind power project looms on the horizon for 2017. If built it will be the first large wind generation to go up in Wisconsin project since Glacier Hills in Columbia County. All told, nearly 50 wind turbines could be built and placed in service in Lafayette County east of Platteville, according to Vanessa Tutos, government affairs director for project developer EDP Renewables. The project enjoys strong support from local landowners. "New wind farm coming to Lafayette County brings boost to WI wind energy industry"
"Wind farm drought may nearing end in Wisconsin"
Today, the Public Service Commission of Wisconsin, which regulates the state’s utilities, approved a Community Solar project for Madison Gas & Electric (MGE). “Community solar” is a single, larger solar project in which a large number of people collectively share in the cost to build the project and share in the benefits of the solar energy production. The MGE project will be 500 kilowatts and will be placed on the roof of the Middleton Operations Center in Middleton, WI. MGE estimates that 250 people will participate in this project. MGE structured its program differently because it has different customer demographics and looked for a program option that would not require a large up-front fee. MGE's application and supplemental responses are available in Docket 3270-TE-101 at the PSC's website, http://psc.wi.gov/. Will Dane County see its first community solar project? That all depends on the Public Service Commission's decision on Madison Gas & Electric's application to build a 500 kilowatt array on a brand new building owned by the City of Middleton. The PSC will decide tomorrow, March 11. Below is an article from today's Isthmus written by Cara Lombardo on the proposed MG&E project. Adam Gusse, vice president of H&H Solar in Madison, hopes his employees can start putting solar panels on the roof of Middleton’s Municipal Operations Center this June. Construction would take a month and a half and result in a solar panel array that would provide 500 kilowatts of power to up to 250 homes currently served by Madison Gas and Electric. The project just needs approval from the Public Service Commission. MGE expects the PSC to rule on its proposal for a solar energy pilot program by the end of the month. 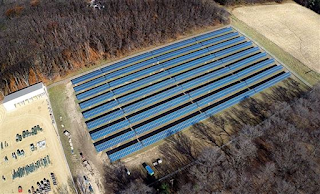 While community solar projects have cropped up across the state, MGE’s project would not only be the first in Dane County but also the first south of the Wisconsin Dells. Bradley Klein, an attorney at the Environmental Law and Policy Center in Chicago, says Wisconsin has lagged neighboring states when it comes to adopting solar energy. Minnesota, in particular, is already operating community solar projects on a large scale. “In Wisconsin, for one reason or another, it’s been hard to get the commission excited about this in the way that we’re seeing in many other states across the country,” he says. But Klein says the MGE proposal is “a good sign” for the state, and that creating strong, stable policy to help the market grow should be a priority. Few utilities were prepared to invest in solar energy until the price dropped by 60% over the past four years, which is driving utilities to consider owning solar themselves. RENEW Wisconsin commends electric providers who are trying to offer a choice despite what Vickerman calls a “vacuum of policy” in Wisconsin with respect to the environmental and economic benefits of solar energy. Because the benefits haven’t received proper consideration, he says, people who want solar energy will have to pay a little more, at least initially. Community solar allows customers to source solar energy from centralized solar panel arrays instead of having to install panels on their homes. More than half of homes are unfit for solar panels, either because the roof is shaded or not properly oriented, and community solar allows for much larger arrays. Customers who choose to participate in community solar arrangements typically pay an initial subscription fee, which can be a few thousand dollars depending on the investment size, to fund construction. Each month, the project’s energy output is measured, and customers receive reductions on their bills based on the amount of energy generated from their shares of the array. It usually takes more than 10 years for monthly discounts to cover the initial investment. But for many, it’s an easy way to support clean energy. MGE’s proposed project is slightly different: Instead of selling shares of the array, MGE would own it and sell customers shares of the array’s output. Under this arrangement, smaller investments would be possible, and upfront costs would be significantly lower, around $380 for an average household subscription of 2 kilowatts. Participants would pay a level rate of $0.12 per kilowatt-hour for energy produced from the panels; the default rate is around $0.095 per kilowatt-hour. However, the solar rate would be locked in for 25 years. Eight community solar projects currently exist in the state, six of which are rural co-ops not regulated by the PSC. Dairyland Power Cooperative, which is based in La Crosse, and Xcel Energy have both announced plans for solar projects that would nearly double the capacity of solar energy in the state. RENEW Wisconsin’s advocacy has once again made the difference for a renewable energy victory. The Public Service Commission of Wisconsin, the state agency that regulates electric utilities, and We Energies have decided not to appeal our October 2015 Circuit Court victory. RENEW Wisconsin partnered with The Alliance for Solar Choice, a national solar energy advocacy association, on this lawsuit. David Bender of Bender Westerberg LLC represented both groups in this matter. The October 2015 Circuit Court decision struck down a new charge that most customers who generate their own power, whether through solar panels, small wind, biogas, hydropower, or other sources, would have faced starting in 2016. The PSC or We Energies could have appealed that Circuit Court ruling, but they have chosen not to. 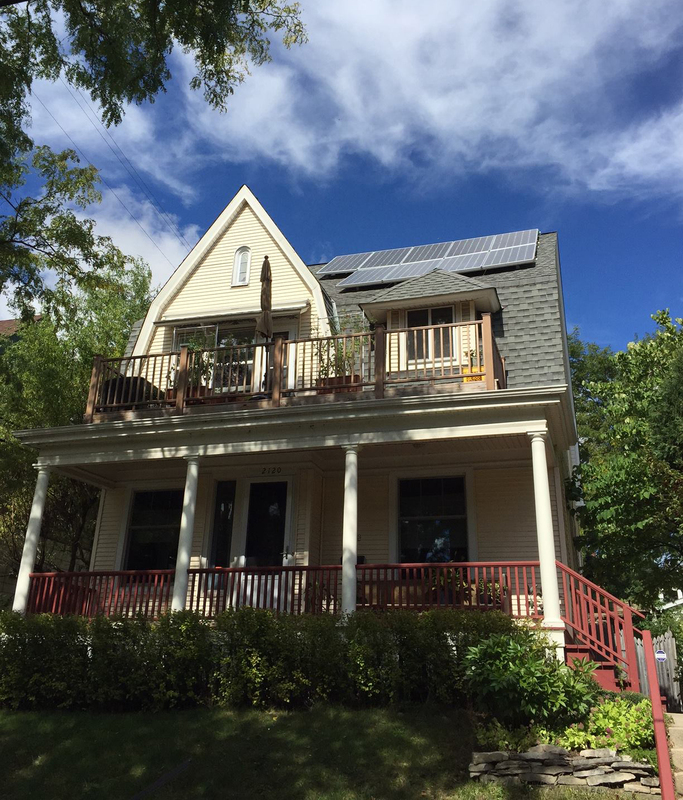 That means We Energies’ new net metering service approved in 2014 will take effect, but without the PSC-approved “capacity demand charge” that would have reduced savings from newly installed residential solar systems by 30%. In addition, the new net metering service sets a much higher cap for project sizes that can participate in the net metering program. The cap is now set at 300 kilowatts (kW) of AC power. The previous cap was 20 kW, which RENEW had challenged in court following We Energies’ 2012 rate case. The 300 kW ceiling for net metered systems was proposed in 2014 by We Energies in response to our previous Circuit Court victory. We Energies typically files a new rate case every two years. If that trend continues, its next rate filing would come in Summer 2016. You can count on us to prepare for that filing along with others proposing changes to rates and distributed generation services.